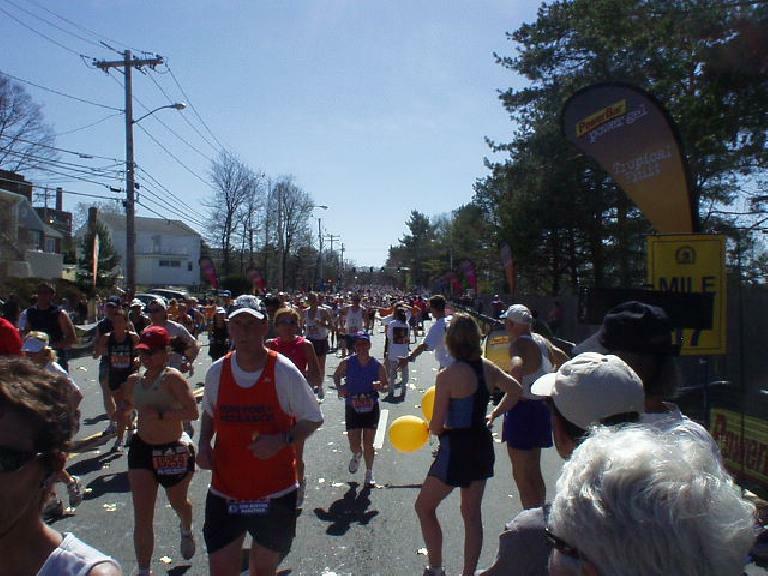 The Boston Marathon is the world’s oldest annual marathon, and one of the most prestigious. Its storied history makes it a must-do for most running enthusiasts and is considered the Mecca for Marathoners. Unfortunately, a basic problem is one needs to qualify for Boston by running a fast-enough marathon, which less than 10% of all marathon lovers are currently capable of doing. So how to do so? I feel qualified to answer this question, having went from running five-hour marathons as recently as 2002 to running a 3:03:24 marathon in 2007. In between, I achieved different milestones ranging from finally beating George W. Bush’s best time of 3:44:52, to running a sub-3:30 marathon, to halving my time deficit to Boston each year since 2005. (See complete race log.) This may not have been the quickest progression, but it was a steady one, one that was absolutely injury free and did not require running everyday. Below are strategies I found effective. Also, see my article in Colorado Runner Magazine on how NOT to train for a fast marathon. Look up your Boston qualifying time. Then, use this race predictor (by Jeff Galloway) to determine roughly how fast you should be able to run a 1 mile, 5k, 10k, and half marathon if you were to be in Boston-qualifying shape. Example: If you need to run a 3:10 marathon, you should be able to run a 5:35 mile, 19:01 5k, 39:49 10k, and 1:27 half marathon. Learn good running technique. This requires conscious effort at first, because most people do not run efficiently or “correctly,” especially when wearing most shoes on the market today. I’d highly recommend reading this ebook (PDF, ~1 MB) by the late British champion Gordon Pirie as soon as possible and be conscious about your running form. The Pose Method also teaches similar good running form. This is important not just for speed but for preventing injury. Get a pair of ultra-light, minimally padded running shoes (e.g., racing flats). The weight savings alone will save you several seconds per mile in a race. They also virtually “force” you to run correctly (by mimicking barefoot running). I’d recommend my Puma H-Streets, but they seem to be discontinued. You can look for other running shoes recommended by PoseTech.com. Use these shoes for both training and racing. If you are far away from hitting the “predicted times” for 1 mile, 5k and 10k, you really should work on your speed before doing any long runs. Running long and slow will just ingrain the habit of running slowly into your body. So how to get faster? Work on form and increasing your leg turnover. Do track workouts, intervals, or fartlek once or twice a week. Entering a lot of short, local races also helps since you are likely to push yourself harder than in training. Even when doing easy runs or long runs, I think it is important to vary your pace when training—even if that means just one or two 200-meter sprints to the next sign post and then walking or running easy the rest of the way after that. Again, running a consistent, slow pace only teaches your body how to run slowly—so frequently remind it how to run quickly, even if only for a few seconds! Once you have decent speed and are ready to think about training for a Boston-qualifying marathon, you can start following one of those “expert” training plans 10-13 weeks before the race. Popular ones include ones by Hal Higdon (which entail running 5-6 days a week) or the FIRST plans by the Furman Institute (which entail running just 3 days a week). Some people follow them to the letter, but I would often just look at them to get the basic idea on how to train, which is to have a long run and a fast run each week with easy rest days interspersed in between, and increase mileage each week until the crucial tapering period 2-3 weeks before the race. The long runs are critical! If you have to choose between skipping all of your short/easy runs vs. the one long run each week, I’d skip the short/easy runs. Also, even though most “experts” recommend a longest training run of no more than 20-21 miles, I found doing 23-25 mile runs helpful—if only for psychological reasons. Don’t get injured. Something like 70% of all runners get injured, which is a sad, but believable, statistic. Jeff Galloway says that most injuries he sees are because people are trying to run too fast. Clearly, one needs to push himself if he is to get faster, but an even higher priority should be avoiding injury even if that means skipping or backing off workouts. Listen to your body. Also, take it easy or (maybe better) don’t run at all if your legs are sore or a body part is hurting in any way. Register for a fast course (one that is flat or downhill). Courses renowned for being speedy include Chicago, St. George (UT), Tucson (AZ), Steamtown (PA), Las Vegas (NV) and the California International Marathon (Sacramento). Internationally, London, Berlin, Amsterdam, and Fukuoka (Japan) are supposed to be good too. Get older. Endurance seems to only increase the older one gets, at least up to 65. Speed doesn’t necessarily drop off too, unless you had already reached your full potential when young (e.g., you were a professional or Olympic-caliber athlete). I know many 40 and 50-year-old people running the best times of their lives. Have faith that as long as you stick with it and don’t get slower, you will eventually qualify for the Boston Marathon since the qualifying times get more lenient as you enter higher age groups. Good luck! And if you qualify in time for the 2008 Boston Marathon, leave a comment below. I’ve already signed up, and maybe we could meet! certain weekly mileage to run a fastie. I ran my first marathon this past May (Delaware marathon). I just wanted to see if I could do it before I got too old to run one. I started reading about the Boston Qualifiers and saw that the Delaware was a BQ. The time didn’t look outlandishly fast to me, so I set a goal to do that. I am 53 years old. I qualified… barely… I damn near killed myself trying. I entered the Boston because I know it’s the opportunity of a life time, and I don’t know if I have the ability to ever qualify again. I will be there on April 21! Thanks for the info! I’m trying hard to qualify for Boston, but am not there yet. I ran the Austin Half in 1:45, but need a 3:35 Full. Do you know if stats are kept as to the fastest 2-3 qualifiers? Chicago didn’t seem so fast to me (4:21 in the heat). I heard Disney is also good. I also run with extra shoe padding, and worry about injury if I use those light non-padded shoes. Thanks! California International Marathon (Sacramento), Chicago, etc. The first four all have significant net elevation loss. CIM and Chicago are flat, but as you know first hand, Chicago is difficult if it’s 90 degrees outside. (That said, when I did it in 2006, it was a bit too cold — <39 degrees the entire time). Regarding unpadded, ultra-light shoes, perhaps this would encourage you to give them a shot: "Kick Off Your Shoes and Run Awhile” (NY Times). Hi Felix, I agree with so much of what you say! Thanks for sharing. In my late 20s and early 30s, I ran 5 marathons and all but my very first were 3:10 and better… I slipped under 3 hours one time. Never went to Boston! Got kinda cocky and figured I’d easily qualify again. I couldn’t have been more mistaken. We have to respect the distance. In the years since then, my running has been on again, off again. I’ve had about half a dozen fairly slow marathons but 3 times I have come in under 3:40. I need 3:20 to qualify for Boston… I’m trying the Jeff Galloway approach with a 15 second walk after 4:45 running at 7:25 mile. By my calculations, I need to repeat that 5 minute “circuit” 40 times to BQ in 26.2! Thanks again for encouraging the chatter! Hopefully you’ll decide to do Boston in 2009 and we can meet then! I haven’t been running very long. I have done 2 marathons. The first in NYC, I really didn’t train or know what to expect and finished in 4 hours. My second marathon I finished in 3:33 and ran with a girl from the running club I joined. I finished feeling pretty good and I think I had a lot more in me. The girl I ran with qualified for Boston, now I need to make an attempt at it. I found your website while doing searches on the Boston marathon. I have been trying to hit the times you posted, as I need 3:10 to qualify. The Texas heat can be brutal in the summer. So far I have hit 19:29 on a 5k race. I have been doing speedwork most of the summer, but I am limited to about 1 hour in the morning and running on the treadmill on my 1 hour lunch. The wife and I just had our first kid, so training, especially 5 days a week has been tough on limited sleep. I got the marathon bug now, so no sense in loosing my conditioning, I just have to adapt to running when I can. Anyway I registered yesterday for San Antonio Rock and Roll, inagural race. They are advertising flat and fast. I have been doing the Higdon advanced for 2 weeks now, so far so good. I am going to Boston, finally! Sixth time was the charm and St. George was the reason. I had run the San Diego Rock-n-Roll marathon 4 times and the Marine Corps Marathon once. I did 3:52:31 in San Diego in June and just did 3:46:26 at St. George last Saturday. I needed a 3:50 or better. My previous times were 4:15, 4:09, 4:00, and 3:57. Weather in St. George started out very windy and cold but ended up cooperating with steady rain most of the run. The last 6 miles being downhill is a huge advantage. I have always been completely exhausted in San Diego and D.C. but I actually enjoyed St. George at the end. Yeah, I was sore, that’s for sure. As far as training for the hills (down and up) I really didn’t do it. I’m sure that’s why I was so sore! I followed Runner’ World, Run Less, Run Faster by Bill Pierce, Scott Murr, and Ray Moss for a 3:50 qualifier and am happy to say, “It worked!” I’m going to Boston! Thanks for sharing! Hope to see you on the 20th! Felix, thanks for your advice and encouragement. I ran the Disney in 3:57 and will try again with the Colorado and the St George. Boston, here we come! I have found two races that helped me qualify for Boston. The Delaware marathon was my first qualifier inMay 2007. I ran a 3:34 to qualify for men aged 50-54. I the ran 2008 Boston. I definitely want to go back. This past November I ran the Philadelphia marathon in 3:39. Tis is good enough to qualify me for 2010 Boston because I will turn 55 before race day. Both these courses are flat and fast. I will definitely be there in April of 2010. My first real attempt to Boston Qualifying @ San Antonio didn’t go so well. I finished in 3:16:03, short of my needed 3:10. The course was pretty fast, but the temperature and mother nature did not cooperate. My second attempt was yesterday @ Mardi Gras marathon. I finished in 3:07:38, and finally BQ’d! The weather was perfect yesterday, the course was flat as advertised, this is definetely a recommended course to get your BQ or a PR. Felix, thanks for your postings, which served as a blue print for me when I started my training this summer. Congrats to all who made it in this year and good luck to all of you as you proceed with your quest to Boston qualify. I have just ran the 2009 Houston marathon after 12.5 months of running. I am 51 and needed a 3:35:59 and ran a 3:30:00. What was my plan? b) get base mileage (for me, 1400 miles) and lots of long runs. c) My runs were aways quick. No dawdling. Long runs were almost marathon pace. d) Super carbo load before the race, pain killers, ph balancer for lactic acid, and well hydrated. e) Run with a pace team. Oops – Correction – I ran with the 3:30 pace team. My time was 3:33:00. I just ran my first marathon, the Hartford Marathon, hoping to run it in 3:10 (7:15 per mile) and qualify for the BM. Even though the website said there would be, there was no pace runner for 3:10!!! I had no watch and so stuck with someone who did…. ended up running my first 10 miles in 1:08 (6:48 per mile) and then slowly died. I walked 5 of the last 7 miles. In the end I finished my first marathon at 3:59. I could barely walk for 5 days but now feel stronger than ever. I really really want to qualify for 2011 BM and so signed up for the marathon in hamilton, on, canada near niagara falls. It’s the only one I could find that’s still open and within a day’s drive. Perhaps I’ll wear a watch. Anyone have advice or a recommendation (ie splits, etc)? Try for 7:10/mile in the beginning? Wish me luck!